From l to r, Dicksson Rammon Oliveira de Almeida, Aryadne Guardieiro Pereira Rezende, Tulio Aimola, and Caio Batista de Melo will spend a year abroad at Fordham through a Brazilian program supporting science and technology fields. Imagine the majestic beauty of the New York City skyline on a crisp summer day. That snapshot will be forever etched in the minds of four young college students who arrived at Fordham by way of Brazil in August to pursue a one-year scholarship exchange program administered by the Institute of International Education (IIE). This year marks the first that Fordham University is participating in the Brazil Scientific Mobility Program (BSMP), which sends students pursuing the STEM (science, technology, engineering and mathematics) fields to colleges and universities across the United States for one year of study. The initiative is part of the Brazilian government’s effort to grant top-achieving students the opportunity to gain global experience, improve language skills, and increase international dialogue in science and technology. Three of the four students comprising Fordham’s first cohort are computer science majors, and one is pursuing chemistry. All are junior- or senior-level students who will return to Brazil to complete their degrees. 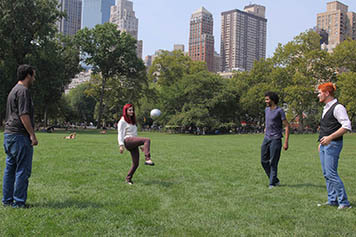 Since arriving on Aug. 25, the students—who became acquainted on Facebook before they met in person on campus—have been immersed in Fordham’s global transition orientation, meeting other students over pizza, learning the lay of the land at Rose Hill on scavenger hunts, cycling in Central Park, and strolling through Times Square. Their weekend plans included trips to Coney Island and Chinatown. “I’m looking forward to watching football—my football,” said Caio Batista de Melo, 21, from Universidade de Brasilia. He is focusing on the area of data mining and is excited to take the Bits and Bots course at Fordham in which he’ll explore robotics. There’s no doubt he will have plenty of opportunities to play soccer on campus, too. Not only have the students left their country, but, as commuter students at home, three left their families for the first time. Aryadne Guardieiro Pereira Rezende, 22, who attends Universidade Federal de Uberlandia, said that while she’ll miss her older brother, she is excited about her first-ever year away from home, and feels that Fordham is the right fit for her. “Fordham not only gives students knowledge, but the values to learn how to use that knowledge,” she said, adding that she hopes her experience here will help her decide whether to apply her computer science background to a career in academia or business. One of six children, Dicksson Rammon Oliveira de Almeida, 21, works while studying at the Universidade Federal del Pernambuco. He said he was worried about not being able to contribute to his family while abroad. “But being here will make it possible for me to contribute more later on,” he said, noting he hopes to work as a developer for a start-up firm in the future. Tulio Aimola, 22, from Sao Paulo, had already left home to study at Universidade Federal de Sao Carlos—though he is grateful for “Skype, texting, and e-mail, which makes it much easier to stay in touch,” he said. Like his peers, he expressed gratitude for the warm welcome they’ve received in the short time they’ve been at Fordham. The cohort will reside at the Lincoln Center campus, enjoying the camaraderie of studying science and technology with their U.S. counterparts while taking in the rich culture of New York City.